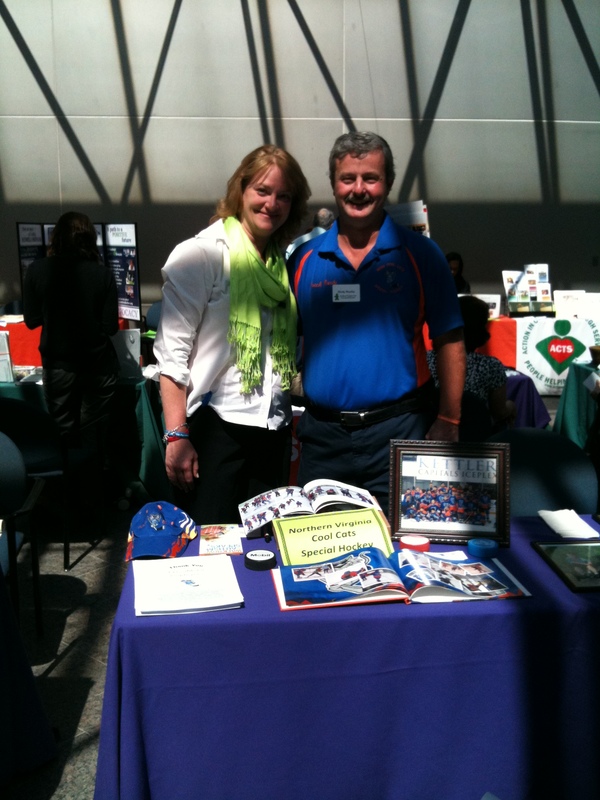 ExxonMobil 2012 | NOVA Cool Cats Special Hockey, Inc.
Coach Randy and Birdie (Service Dogs of Virginia) at the table. Birdie and Peggy Law of Service Dogs of VA. We shared the table. It was the Cat-Dog table. ExxonMobil Employee Fair has the ExxonMobil employees scan a bunch of tables in their conference room and atrium. The tables have at least two organizations at them. The employees pick an organization of their choose to donate to the organization by payroll deduction. Each agency will have 1/2 of a 6-foot table. Each table will be skirted and an agency sign will be on the table. The Cool Cats have been at the ExxonMobil Employee Fair for the past four years. Coach Randy deviates his schedule day off to attend the event.